The icy cap over Earth’s North Pole reaches its summer minimum in September and its winter maximum in late February or early March. Satellite observations since 1979 have shown that amount of ice that survives the summer is getting smaller; declines have been especially dramatic in the past decade. Recently, scientists from NASA and the National Snow and Ice Data Center described another way Arctic sea ice is changing: the summer melt season is getting significantly longer. These maps represent changes in what the scientists describe as the “continuous melt season.” It is usual for the first melt events of the spring season to be interrupted by a return to freezing conditions. But eventually a day arrives when melting is continuous for the remainder of the summer: this is the day of melt onset. The season of continuous melt ends with the first freeze event of the fall. According to this analysis, the average length of the continuous melt season in the Arctic increased by 6.4 days per decade between 1979 and 2007. In some places, however, the trends were far larger than the average, espcially around the lower-latitude edges of the ice pack. The graph below the figures illustrates how the length of the melt season varies significantly from year to year, but the long-term trend is clear. The maps also show that, in most areas, the date of freeze onset is changing more than the date of melt onset. 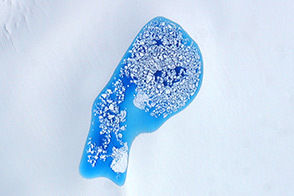 The scientists say this pattern is consistent with a climate process known as the ice-albedo feedback. Dark ocean water absorbs more sunlight than bright, reflective ice. Even a small change in the start of the melt season exposes the ocean to more incoming sunlight, which warms the water, which melts more ice, and so on. The more solar energy the ocean absorbs during the summer, the longer it takes in the fall for the water to cool down enough to freeze. 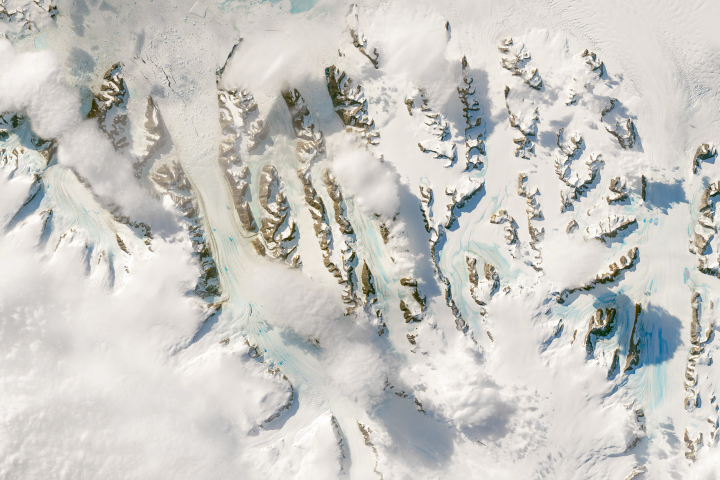 NASA Earth Observatory image by Robert Simmon, based on data from Jeffrey Miller and Thorsten Markus, NASA GSFC. 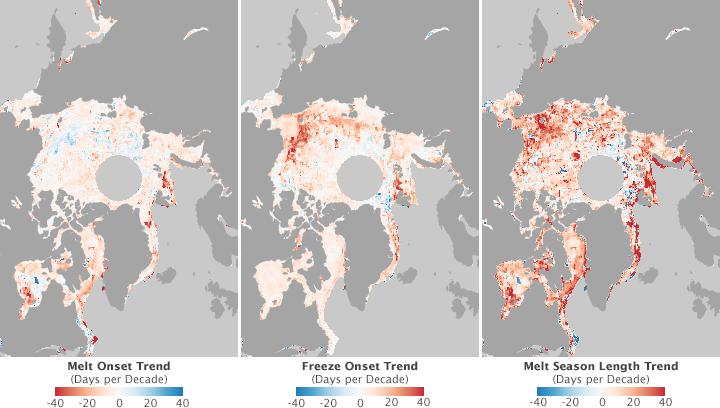 This trio of images shows changes between 1979 and 2007 in the average date of melt onset in the spring, the first autumn freeze, and the total average increase in the length of the Arctic sea ice melt season.